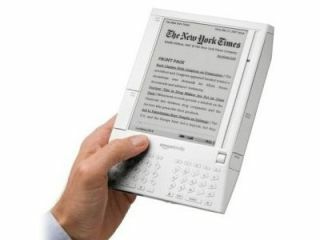 Amazon preparing Kindle 2 after all? We're not big into hardware rumours accompanied by blurry photos here, but we will make an exception to bring you news that Amazon appears to be readying a new version of the Kindle e-book reader. In spite of repeated denials that Kindle 2 will arrive any time soon, Amazon appears to have created a successor to the wireless e-book. Either that or we're really looking at an old pre-Kindle 1 prototype. Either way, the mystery device looks very similar to the existing model with a few minor tweaks. The keyboard has been redesigned and some of the other buttons moved around, presumably to avoid accidental presses. The screen and case look familiar, although the edges of the unit are now rounded instead of angular. In place of the scroll wheel on the current Kindle, the 'new' version has a mini joystick, and the device now charges via USB, not through an AC adapter. Lastly, the SD card has gone for some reason, which leads us back to our original thought – is this really a new Kindle or just a dusty old pre-production dummy?